Rick Ackerman publishes the Rick’s Picks blog and website, and this week he asked an intriguing question: will Apple Inc. signal the top of the market? In other words, is the recent run-up on Apple similar to the over-hyped valuations we saw just before the dot com bubble burst at the start of the century? You could certainly make the argument that AAPL – Apple Inc. is NOT over-valued. It’s forward PE ratio is around 11, which is not exactly in the stratosphere. At the peak of the dot com bubble there were many companies with no earnings, so they had infinite Price Earnings Ratios. Apple actually makes a product. In our family we have numerous iPods and iPads, and I’ll be purchasing another iPod next week (since I dropped mine this week and cracked the screen). I listen to my iPod every day. I don’t listen to music; I download podcasts, for free, and listen to those, from my iPod, through my car speakers, while I’m driving to and from work. The counter argument, of course, is that three years ago the stock was trading at $124, and yesterday it closed at a shade under $573. That’s a 362% gain; not bad for three year’s work. A big chunk of that gain has happened in 2012; Apple started the year around $405, so it’s up over 40% so far this year, and it’s only April! 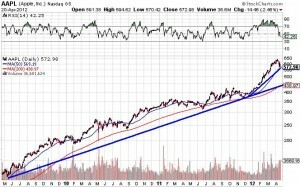 We all know that no stock can increase forever, although if you watch CNBC you would think Apple may be the exception. Over the last month or so I’ve had CNBC on in the background while doing my workouts, sometimes at 6:00 am, sometimes during the trading day. They’ve had lots of commentators on who have gone on record that saying $1,000 is quite realistic, with some even projecting $1,200. 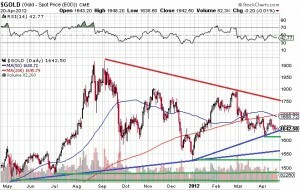 However, since trading above $640 on April 10, Apple traded as low at $570.42 on Friday, a more than 10% drop in less than two weeks. What goes up, must come down. The bulls will argue that after a run of that magnitude a profit taking pull back is normal, and healthy. That makes sense, and you can’t argue with that logic. 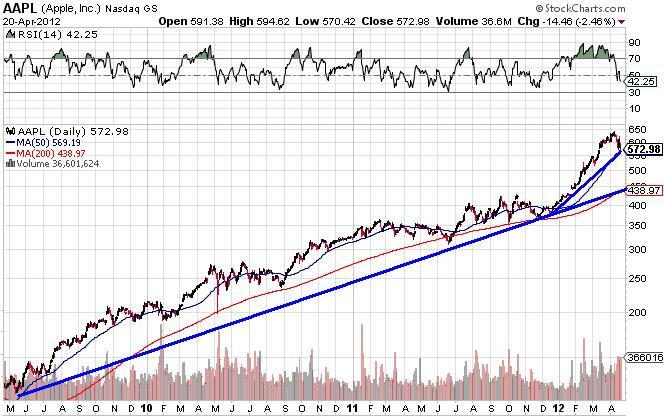 The long term chart is still in an uptrend. So back to our original question? Is Apple a harbinger of things to come? Apple represents about 12% of the Nasdaq, so obviously a crash in Apple will depress Nasdaq. Mathematically Apple is not part of the Dow, so it won’t change, but is it a leading indicator? My gut tells me that yes, it is. The average guy on the street knows that Apple traded at over $600, and the average guy, hearing stories of big new highs, probably assumes that that’s good news, and is indicative of market strength. If Apple keeps going up, market psychology will probably stay positive. However, Apple has not “stayed up” over the last two weeks, so we have not read stories about new highs. A lack of “new highs” stories may negatively impact the market. I agree that Apple will be one to watch. If it fails to take out it’s highs, just as the general market has failed to exceed it’s all time highs, the “Mother of All Bear Market Rallies” will be just that; a bear market rally, with more downside to come. The direction of the general market is important. As we learned in 2008, if the market crashes, even the “safe havens” like gold will also crash. However, gold rebounded quickly, so even if we do see a correction, I am of the view that it’s time to start deploying some additional cash. As the chart of gold shows, gold’s medium term down-trend since the peak last summer is still in progress, but the long term up-trend remains intact. 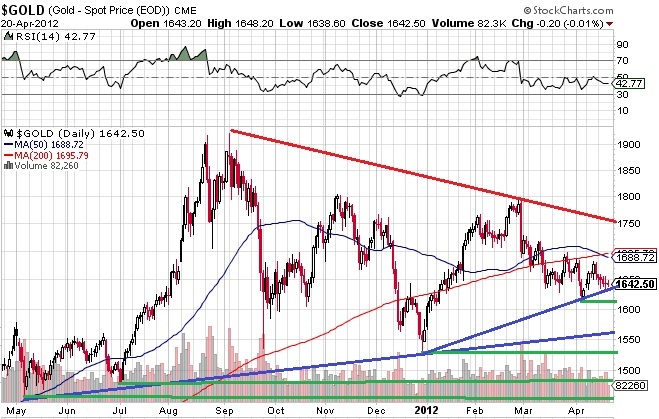 Most encouragingly, gold continues to make a series of higher lows (that’s the green lines), and the wedge formation can’t go on forever; we either go up, or down. My thinking on the blue chips is: they are blue chips, so are unlikely to get killed; they are already down substantially from their peaks. Also, stocks like Agnico-Eagle pay a decent dividend, over 2%, which is better than sitting in cash. My other thought: if these blue chips are long term holds, I can increase my returns by selling some out of the money covered call options. I pocket a few cents when I sell the calls, and if the stock stays stable I keep the premium. If the stock goes way up my stocks get called, but I make a profit on that as well. More details next week if I start covering. I also picked up a few juniors to balance things out, but I’ve still got lots of cash, so we will wait and see what happens from here.